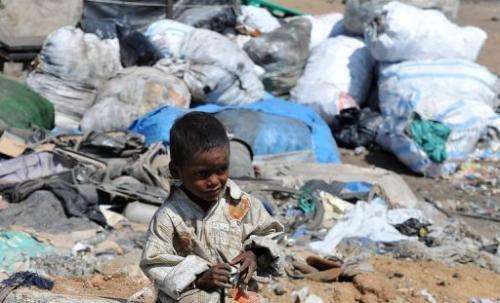 An Indian child plays in a slum on the outskirts of Hyderabad on June 5, 2012. Scientists from 55 countries opened a two-day meeting Monday to mull how to use science to fight poverty and promote sustainable development. Scientists from 55 countries opened a two-day meeting Monday to mull how to use science to fight poverty and promote sustainable development. Taking part were members of the InterAcademy Panel (IAP), a global network of 106 national science academies tackling such issues as global warming, population growth, human reproductive cloning and evolution. "It's an opportunity to raise the voices of science academies around the world, to see, discuss the role of science to overcome the major challenges facing mankind," said Marcello Barsciski, a researcher at the Rio-based Oswaldo Cruz Foundation. The theme of the conference, he added, dovetails with discussions at major international forums such as the UN Rio+20 summit on sustainable development last year. Based on the "Future We Want" document signed in Rio last June, the panel organized its meeting to find solutions for the welfare of mankind and for sustainable development, said Eduardo Krieger of the Brazilian Academy of Sciences. "This conference is important because we have an agenda until 2015, but nothing scheduled beyond that," noted Jorge Chediek, the Brazil representative for the United Nations Development Program. He pointed to the Millennium Development Goals to eliminate global poverty by 2015, arguing that they were "influenced by industrialized countries" and now required input from the least developed nations. "Science has a role to play. We know we have to change the path of development and this implies changing the civilization path and showing the world a better way," Chediek said. The debates will also focus on food security and climate change. Conferences of the InterAcademy Panel, a body created in 1993, are held every three years. The ONLY way to wipe out poverty is to get rid of the greed among the rulers of the planet. When the top wealthiest on the planet quit hogging all the resources and keeping the rest of us impoverished, we can look towards true equality. As it is, equality is just a word.